Several years ago, a collaboration between computer graphics and computer vision researchers at the University of Washington and Microsoft yielded Photosynth (http://photosynth.net/), a revolution in organizing and navigating digital photographs. 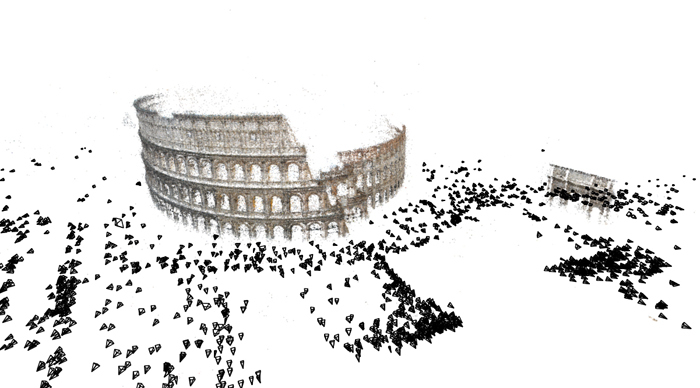 Now, that same collaboration has yielded "Rome In A Day," which reconstructs entire cities from images harvested from the web, in less than a day of computation time per city. Entering the search term "Rome" on Flickr.com returns more than two million photographs. This collection represents an increasingly complete photographic record of the city, capturing every popular site, facade, interior, fountain, sculpture, painting, cafe, and so forth. It also offers an unprecedented opportunity to richly capture, explore and study the three dimensional shape of the city. In the "Rome In A Day" project, the UW and Microsoft researchers built a parallel distributed system that downloads all the images associated with a city - say Rome - from Flickr.com. It matches these images to find common points and uses this information to compute the three dimensional structure of the city and the pose of the cameras that captured these images. All in less than a day. This poses new challenges for every stage of the 3D reconstruction pipeline, from image matching to large scale optimization. The key contributions of the work are a new, parallel distributed matching system that can match massive collections of images very quickly, and a new bundle adjust software that can solve extremely large non-linear least squares problems that are encountered in three dimensional reconstruction problems. The technique could create online maps that offer viewers a virtual-reality experience. The software could build cities for video games automatically, instead of doing so by hand. It also might be used in architecture for digital preservation of cities, or integrated with online maps.